WASHINGTON (Reuters) - Canada's Enbridge Inc and Spectra Energy Corp have won U.S. antitrust approval for a $28 billion merger that will create the largest North American energy infrastructure company. The Federal Trade Commission said on Thursday that it would approve the deal. The merger was announced in September 2016.Enbridge's pipelines mainly send Canadian crude from oil sands to refiners on the U.S. Gulf Coast, while Spectra's network ships natural gas to the U.S. East Coast. Share prices of both Enbridge and Spectra were down slightly on Thursday. 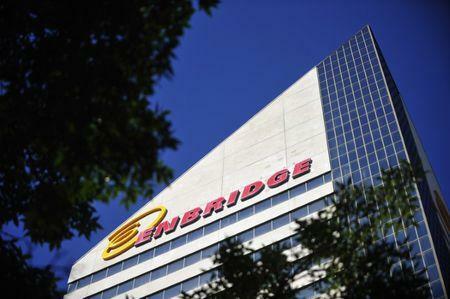 Enbridge was trading at $55.31, down 1.09 percent, while Spectra was at $41.55, down less than 1 percent. The FTC's conditions were aimed at preventing a reduction of competition among natural gas pipeline providers in the Gulf of Mexico off Louisiana's coast. Enbridge owns the Walker Ridge Pipeline while Spectra has an indirect stake in the competing Discovery Pipeline through its interest in DCP Midstream. Once the deal is concluded, the merger would give Enbridge ownership interests in the two closest pipelines in parts of the Gulf of Mexico, the FTC said in a legal filing. To resolve this, Enbridge agreed to establish firewalls that prevent it from accessing non-public information about the Discovery Pipeline, among other steps. Enbridge must also notify the FTC before increasing its DCP stake or acquiring other pipelines in the region. The condition is to remain in place for 20 years, the FTC said in a statement. The companies also announced that the FTC had approved the deal. "The final regulatory requirement for closing is clearance under the Canadian Competition Act. The companies continue to expect the transaction to close in the first quarter of this year," they said in a statement.